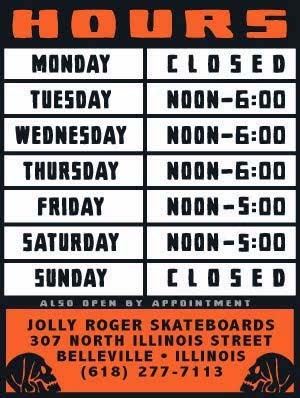 Jolly Roger Skateboards: New Shop Decks are in Stock Now! New Shop Decks are in Stock Now! New shop decks are here! Local tattoo artist Don Will spends enough time here printing his own limited edition "Fist City" skateboards and tees that we thought it would only be fair to show our appreciation by having some "Fist City" decks printed up so he can get his artwork out to more of the kiddies. These decks are available in 7.75, 8, 8.25 and 8.5. And we finally got a chance to run our "Jolly Jesus" graphic (inspired by the Dead Kennedys). These decks are available in 8.5, 8.6 Shovel Nose, 8.75 Diamond Nose, 8.8 popsicles and 9 inch pool shapes.